CDC confirms York High School mumps case. And basketball fans may have been exposed. This Feb. 6, 2015, file photo shows a measles, mumps and rubella vaccine on a countertop at a pediatrics clinic in Greenbrae, California. A school-aged child at York High School has come down with the first case of mumps in Maine this year, according to the Maine Center for Disease Control and Prevention. The student may have exposed others to the highly contagious viral disease between March 6 and 8, including at a unified basketball game at Massabesic High School gym in Waterboro on March 7. The student was unvaccinated and contracted the virus while traveling outside of the U.S., according to the CDC. On Friday, York High School sent out a letter informing parents and guardians of the case. Between Jan. 1 and Feb. 28 of this year, 30 states reported mumps infections in 151 people, according to the U.S. CDC. The case in Maine was reported just two days after lawmakers heard testimony from hundreds of people on legislation that would remove exemptions that currently allow parents to opt out of immunizing their children against measles, mumps and rubella, and other diseases. The bill would effectively require parents to have their children vaccinated before enrolling them in public schools. Mumps is an airborne illness that is preventable through vaccination. “Mumps is spread by mucus or droplets from the nose or throat of a person with the disease, usually when a person coughs or sneezes. The most common symptoms usually start with fever, headache, muscle aches, tiredness and loss of appetite followed by swelling of glands,” according to the Maine CDC. Symptoms can set in as late as two to four weeks after a person becomes infected. People with the virus may exhibit only minimal symptoms and not even know they have it. If untreated, mumps can cause deafness, meningitis or swelling of the brain, testicles and more. In rare cases, it can be fatal. Since mumps is a virus, it cannot be fought with antibiotics. Instead, fluids and rest combined with over-the-counter pain relievers are most effective. The vaccination against measles, mumps and rubella, or MMR, is a two-step process. It’s administered to children between 12 and 15 months, then again between ages 4 and 6. 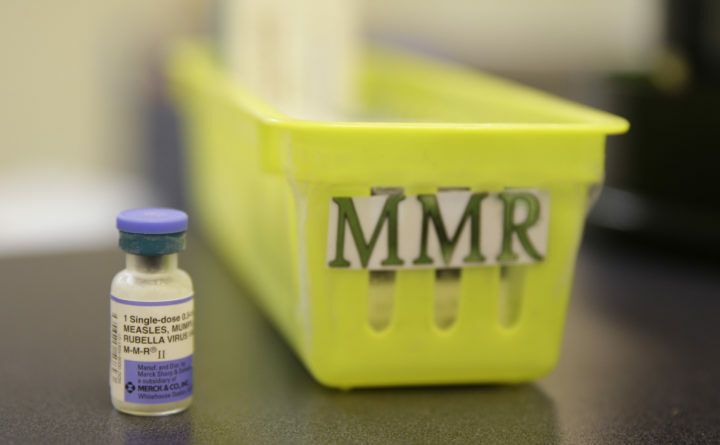 Two doses of the MMR vaccine gives the child “about an 88 percent reduction in risk for mumps,” according to the U.S. CDC. Since the U.S. mumps vaccination program began in 1967, the CDC has recorded a 99 percent decrease in cases. However, between Jan. 1 and March 7, measles cases were confirmed in 13 different states. Maine has not yet recorded a measles case this year, but state data revealed that fewer than 95 percent of kindergartners at about 160 schools were vaccinated against measles during the 2017-18 school year.